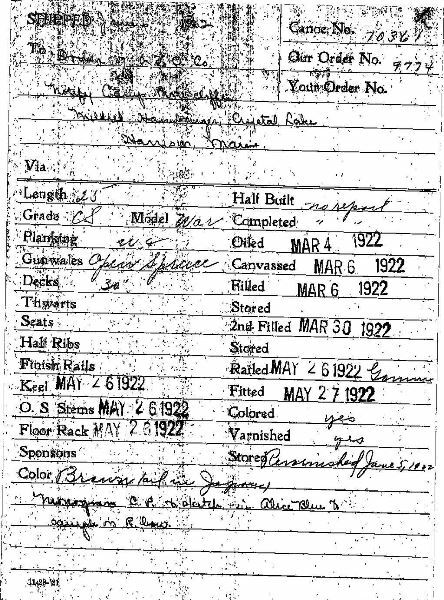 This is a copy of the Old Town build record for this war canoe number 70361. 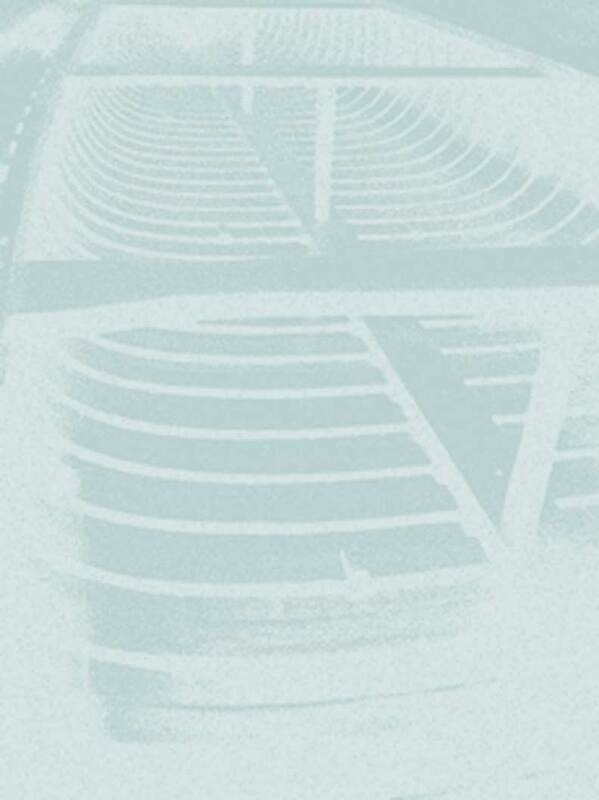 The scanner must have been a bit dirty when this copy was made. 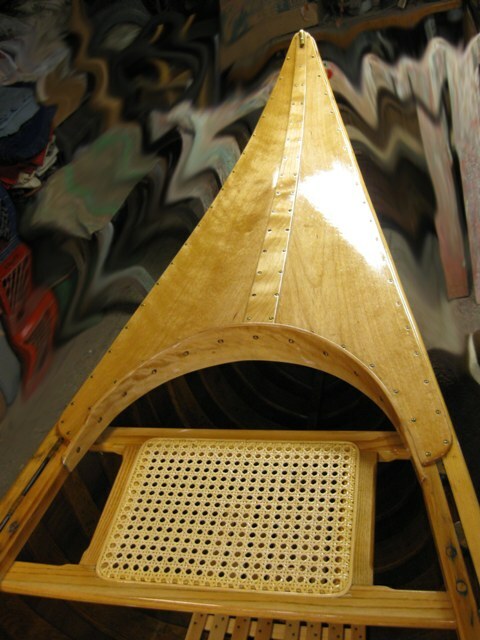 The details show a 25 foot CS grade war canoe with western cedar planking, open spruce gunwales, 30" decks, a keel, outside stems and floor racks. It was painted brown with "monogram C.P. to sketch in Alice Blue to sample on right bow"
Alice Blue?? From Wikipedia: "Alice blue is a pale tint of azure that was favored by Alice Roosevelt Longworth, daughter of Theodore Roosevelt and which sparked a fashion sensation in the United States. The hit song "Alice Blue Gown" inspired by Longwort's signature gown, premiered in Harry Tierney's 1919 Broadway musical Irene. The musical was made into a film in 1940 starring Anna Neagle and Ray Milland." Below are pages from the 1922 Old Town catalog describing the CS grade and the War Canoe. 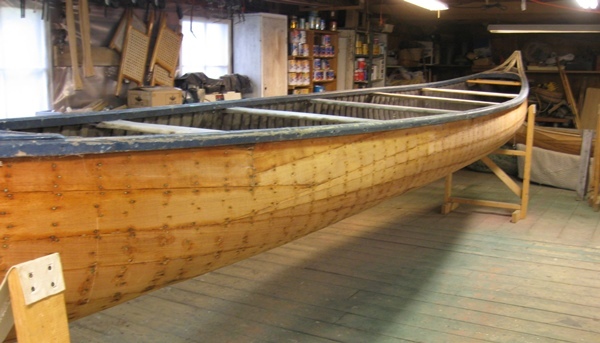 A survey of the canoe shows that it had been fiberglassed and that the obvious damage was the missing outside stems, cracked and damaged bow deck, missing stern deck, broken stern coaming, and damaged gunwale tips. The floor racks were also missing. The gunwales, inwales and decks had been painted blue. 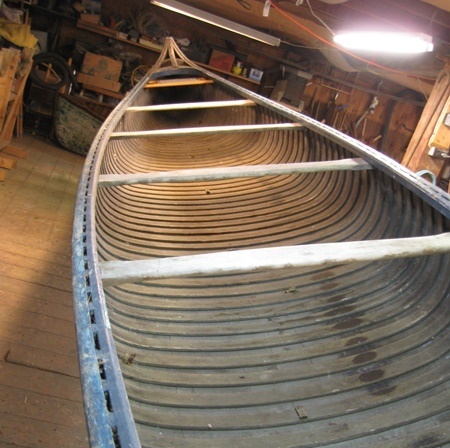 The steps in the restoration process will be these: remove the fiberglass, remove the gunwales, deck, keel, seat, and thwarts; strip the old varnish from the interior and the blue paint from the inwales; determine any wood repair to be done; seal and varnish the interior; oil the exterior of the hull; canvas; fill the canvas; paint the canvas. Along the way the repairs will be done; a new stern deck and coaming will be made; new outside stems will be made; the 5 thwarts will be refinished; and new floor racks made. It may be necessary to make a new bow deck - we'll see. Here's the canoe upon arrival. The missing outside stems would be extensions of the keel, wrapping up the curves of the ends to the tip of the decks. Half of this side's fiberglass has been removed. A heat gun is used to loosen the fiberglass resin and then the glass cloth is pealed off in pre-scored sections. Notice the planking pattern. This western red cedar was available in long lengths with no knots. You can see the old varnish and blue rails. Also the missing stern deck and the thwarts with worn out finish. The little tab on the bottom is one of several which, with short lengths of brass stem band as spinners, hold the floor racks in place. This is the damaged tip of the bow deck. The left side of the deck is split longitudinally along its convex and may not be repairable. Removing years of varnish. 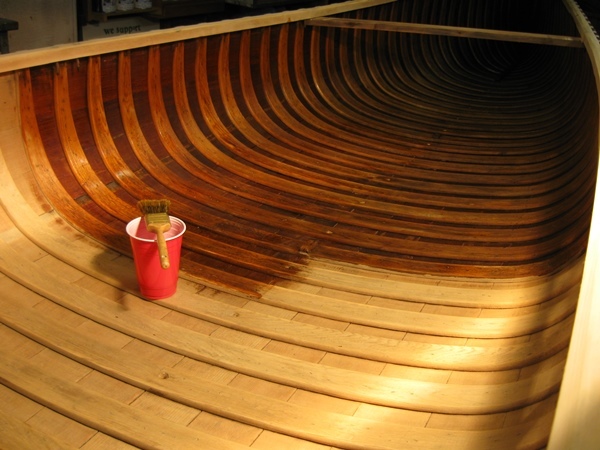 Stripper is applied to soften the varnish and then the heavy layer of gunk is removed with a scraper. Subsequent coats of stripper are applied, brushed with cedar shavings which act as an abrasive and also absorb the removed varnish. Once the interior is stripped it is washed with a two part teak cleaner. The interior and inwales are stripped and washed. Now the ribs and planks are sanded by hand, going with the grain of the cedar. Then the surface is vacuumed and tacked. The interior is sealed with varnish and thinner 50% each. The the varnish will be laid on with decreasing amounts of thinner. The old wood is really soaking up the sealer so it will probably take 5 coats of varnish to finish. The 80 year old cedar begins to take on its dark golden brown patina. A 30' length of #8 duck canvas is folded in half length wise and secured at one end to a fixed hanger and at the other end to a come-a-long. 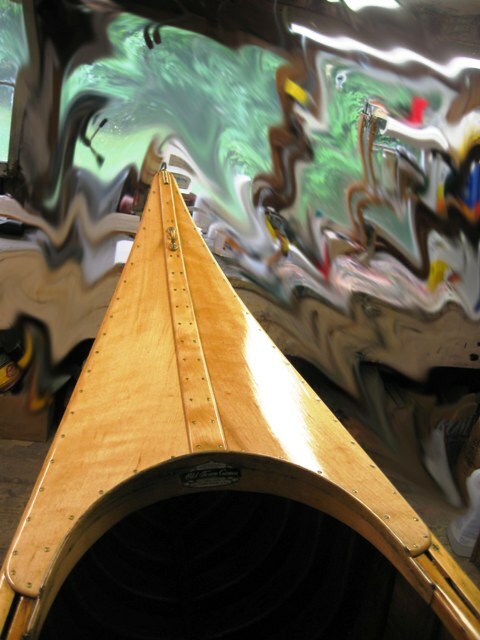 The canoe is laid into the canvas and poles are inserted to keep the canoe pushed to bottom. The come-a-long stretches the canvas taut. and split boards called clothes pins are added to keep the canvas close to the ends of the canoe. Excess canvas is trimmed to allow for tacking. The canvas is stretched with pliers and two tacks attach the canvas at each rib. Notice the puckers above the tacks showing the tightness of the canvas. 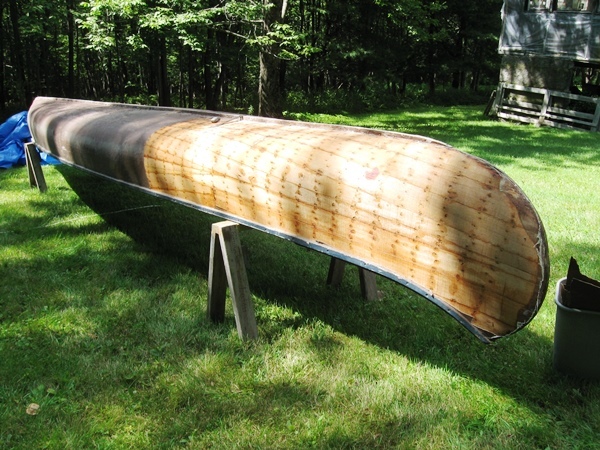 Once both sides of the canoe are tacked, the canoe is removed from the come-a-long and turned over so the ends can be tacked. Most of the excess canvas is trimmed and then the canvas is cut along the fold. 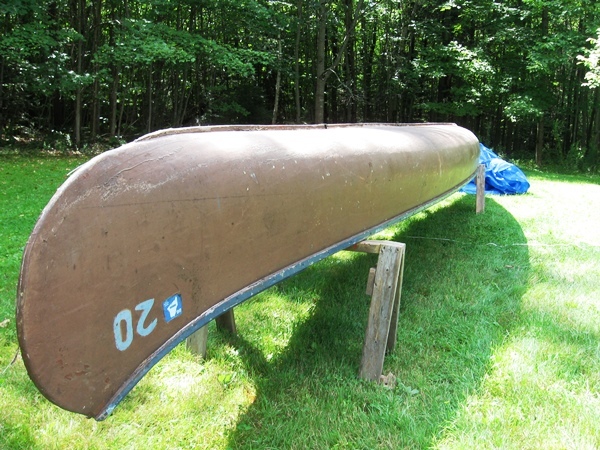 Bedding compound is applied to the curve of the canoe and one side is stretched around, tacked and trimmed. More bedding compound is applied to the first layer of canvas, and the the second side is stretched, tacked and trimmed. The same process is used to finish the other end. Next the canvas is scorched with a plumbers torch to remove the fuzz from the canvas; the a coating of mildewcide is applied to the canvas. Now the filler is rubbed into the canvas to fill the nap and provide a smooth waterproof surface for painting. The filler is a mixture of paint, boiled linseed oil, silica, thinner, and Japan dryer. Three coats will be rubbed in, forced deeply into the nap of the canvas. The filler will need to cure for sometime so that all the volatile oils have a chance to work their way out. 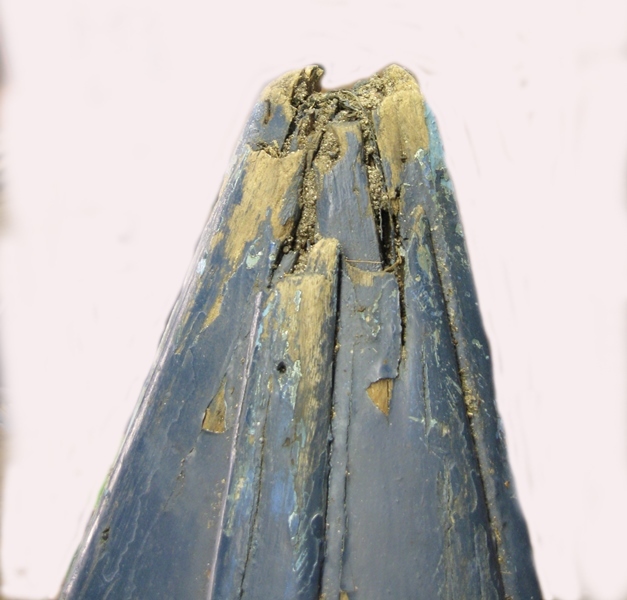 Much has been done since the filler was applied to the canvas. 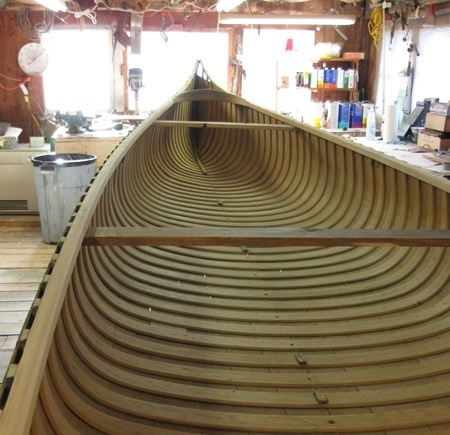 The filler has cured, the outside stems have been milled from ash, steam bent over a mold, shaped and installed on both ends of the canoe meeting with the ends of the keel. The gunwales have been installed and refinished and the canvas has received two cots of primer and two coats of brown. Now the decks can be made and installed. The bow deck was determined to be too cracked and worn to be used, so two new decks are being made. The wood is native, figured yellow birch which has been resawn to produce two pieces that will result in bookmatched decks. The birch has been planed and rough cut into 4 sections. Patterns are made and the birch is cut and fitted and finished, as you can see below. Left is bow deck, right is stern. 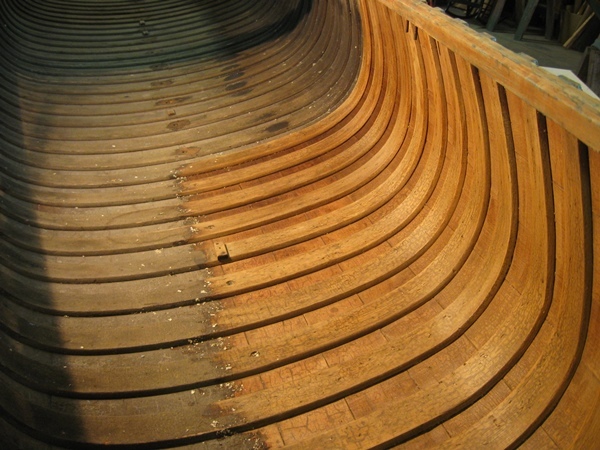 The restoration process has taken the 1922 war canoe from this state to the one below! Showing new decks and floorracks.